Great, you are doing well with your detox. I created this site for you, heavy metal poisoned patient and/or relatives. You will find the information you need and the support of many others that are in the same spot as you are and, most importantly, those who reached the light at the end of the tunnel. Register and instantly start your detox with videos, articles and forums with direct feedback from Chlorellaman. My daughter and I just tested for heavy metals, she is only 4 and tested off the charts high in Barium... 6.7 or below is normal, she tested 15.5... I need to know how to chelate a child and do not fully understand your directions even if they are safe for kids... you do this amino thing for 4 days and then 2.5 hours later the next step and another 2.5 hours later vitamin C?? I really hope we can talk. just got a heavy metal urine test which says high barium, lead and mercury. which amino acids and what protocol should i pursue? baby--any thoughts/resources that are baby-specific? his metal levels have fallen. He has been doing this since oct 2011.
you willing to look at his hair & other tests and help him? I don't know here to start. What tests do I do? What do I try first? There is no obvious set plan to follow. It is very frustrating. Do you have an updated program that you could send me? I would like to share with you. Something I experienced, tested, during my detox. It took me years to come up with it. And some of you might say I could have read that in a scientific article. The body needs some supplements to be well, such as vitamins, minerals, foods, water. I find out in my detox years of bliss,joys misery that it takes a very small quantity of a given supplement to be well. Sometimes it’s a combination of supplements. There is a subject I'd like to touch. It's the tremendous similarities between heavy metal poisoning and autism/autistic symptoms. I first started to get a clue, because of some video comments for detoxmetal on youtube – detoxmetal is Chlorellaman’s youtube account. It has been 5-year I started this site. Let’s remind ourselves that at the time I was very sick as you have seen in my videos and on youtube. At the time Heavy Metal Poisoning Detox information was scarce. Very scarce. A bit like if today you were trying to do say a plastic detox, or a spaghetti detox. Even the name detox was not out there. Except for a few rare site that were helping you out with detoxification. Then I guess I was one of the first to get sick and try to find an answer online. I was a web programmer then. So if I needed to find information and it was not online, it didn’t exist. The flu shot cleaning came in the company I worked for today. $25 for consultants, $15 for employees. Well I didn't go. It was convenient, it was cheap, but to get poisoned they should pay me a lot of money. Now if you know about mercury poisoning, you don't get your flu shot if it's not the thimerosal free flu shot vaccine, which really means mercury free flu shot vaccine. Now it's a shame that they seem to advertise poison-free vaccine for pregnant women only...It should be for everyone! And who in the name is going to ask for thimerosal-free? can't even pronounce it. Now mercury-free that's easier to pronounce but it would make the regular ( mercury-loaded) flu shot vaccine a marketing disaster. Is it so much more expansive? not even the double. When it comes to Mercury poisoning, spending thousands with chelation therapies, that's a clear choice. Unless this whole industry is about getting sick and providing the cure, making people pay in both cases. Unfortunately for me helping you out and being limited by reason, language and pre-conceptions. And thanks God because it allows us to grow beyond reason, and really feel our human nature and divine origins. So yes, there is a lot of information on this site that doesn’t make sense. And yes in my healing there are a lot of things that didn’t make sense. Like… When I realized I was healed, 6-months had passed. Why? first because it’s not an event, it’s a process. It’s in movement , so it’s hard to say how it is at a specific given time. Because it might fluctuate from sky nine to cloud nine ( I love making up words*) at a rate that is not reasonable. Second because healing is divine and truly magical, in the realm of miracles. And although it’s really something we are all equipped with, our culture has given up on all magical experimentations of a certain sort. I am referring to the 1960’s and early 1970’s experimentations of ‘we are God’. It may not have worked out but not to the point of dismissing the whole discoveries of that era. The power to create our own reality, and so healing. With Mercury and Lead Symptoms, I got to the point that what I really wanted is information, so I can walk again without a cane, run Forest run! While Doctors are educated to give prescriptions drugs more than likely until we pass over for the sake of profit or ignorance, I educated myself how to heal... Let's them search and research while we detox will you? 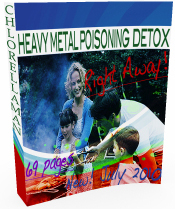 How to detox heavy metals poisoning? Patiently but surely. In 18 months+ of sickness I developed my own personal heavy metal detox diet. You need to follow those steps or else you will get worse. Help, I need assistance and support... Get the heavy metal detox diet!